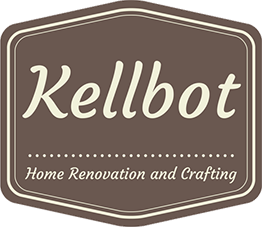 New Project: Lamps - Kellbot! | Kellbot! At work it often gets very loud in my office, so everyone wears headphones. Unfortunately this makes it difficult to get someone’s attention, because they’re all rocking out to David Bowie or whatever. Also, it gets very dark in my office because we don’t have desk lamps. The solution, clearly, is networked USB lamps that you can make blink if you want to get someone’s attention. Someone else suggested a cheaper solution would be Nerf balls to throw at each other, but that’s way less fun to build. 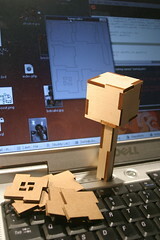 Here’s my prototype for part of the first lamp. I’m making 5 lamps total, and they’ll all be different. Each lamp will have white LEDs for general lighting, and then different colored LEDs for various alert functions. The first couple will probably just use normal, colored LEDs. I’ll try some RGB LEDs later, they’re just so stupidly expensive compared to normal LEDs. I wrote a program in Processing to generate the parts, so I can easily make models of different sizes or with different thickness materials. I’ll post it in a bit when things are a little farther along. I’m using an Arduino to prototype the electronics, but will probably switch to something cheaper like an ATTiny when I go to build the lamps. Just because it’s handy, I’ve written the prototype drivers for the lamp in Processing, but that’s only because I already had it open. Eventually I’ll want something that can hang out in the systray / menu bar, and I don’t think Processing allows for that. Tho one advantage of Processing its an easy way to make executables for both Mac and Windows. Or it pretends to be, I’ve had inconsistent luck getting Processing applications to run on my windows machine. Thanks, Java!